Budapest boat tours are one of the best ways to feel touched by the city of Budapest, what is more the riverfront attractions of Budapest lighting up after sunset is a sight to behold. Taking a river cruise in Budapest is an unforgettable experience, and a night cruise when all the riverside sights of Budapest are illuminated is the undeniable highlight of many tourists’ Budapest holiday. 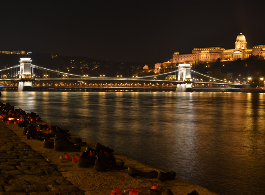 Some take a boat tour to get romantic, others are on a whistle tour in Budapest, and want to see the major attractions with a guided tour in an hour or so, and some travellers feel that this is the best photo opportunity in Budapest. 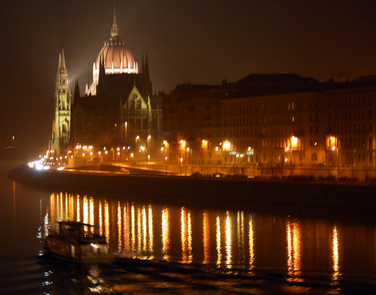 We agree, a Budapest river cruise is a must do, and one of the top ten things to do in Budapest! Mahart PassNave specializes in Budapest boat tours as well as longer trips like Budapest Vienna hydrofoil trips. 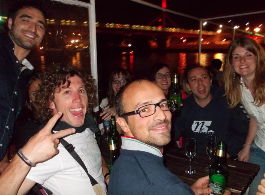 Boat tours include 1 hour sightseeing tours, and night tours on the Danube with a dinner (‘Budapest by Night’). Budapest river cruises organized by Hungaria Koncert Ltd: the Danube river cruises are quite versatile, ranging from the cheap 13.5 euro Budapest river cruises ( Midday Boat Ride ) through their popular Dinner and Cruise Budapest night boat tours (at 7 pm and at 10 pm, with dinner OR without dinner) to the fun cruises like the late night Budapest Boat Party cruises and the Cocktail/ Beer afternoon cruises. It has always been a big divider among locals and tourists if it is worth having a Budapest Danube cruise with Dinner or it is better to just have a night river cruise and eat on land at one of the best Budapest restaurants. As it is quite unpredictable if you personally will like it, follow your instincts. The prices are quite affordable whether you eat on the river or on land, so the question is if you prefer land based restaurants with good reputation, or a more romantic setting (candle lit, river views, etc.) with a variety of meals to choose from (cruise dinners are typically buffet style dinners with multiple choices). You can also buy package deals to save some money, including Hungarian Folk Shows (the award winning & world touring Hungarian State Folk Ensemble, Danube Folk Ensemble, Rajko Folk Ensemble) or bath entries to Szechenyi Baths. River Ride ‘boat’ tours in Budapest are unique as the tours take place in a ‘water bus’ (an amphibian, or amphibious vehicle going on land and in water too). The two-hour Danube tours run 4 times a day from April to October (1o am, 12 pm, 3 pm, 5 pm) and 3 times (11 am, 1 pm, 3 pm) a day in low season (Nov-March). 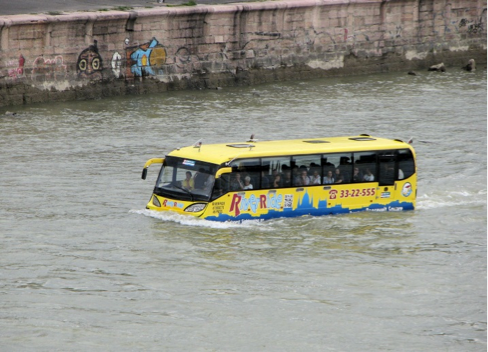 RiverRide boat-bus tours leave from Szechenyi Istvan square (former Roosevelt Square), at the Chain Bridge in Budapest. Please note that while the River Ride may be a good option for adults and teens, toddlers and kids can easily get often bored while floating on the river in a closed bus (even if the idea of an amphibian is intriguing, it is indeed a closed box – understandably). If the weather is nice, we suggest taking smaller kids on an actual boat tour where you can go on the upper deck, look around, feel the fresh air and the water, etc. (We have actually tested the vehicles with kids plus read through RiverRide reviews on Budapest travel sites).